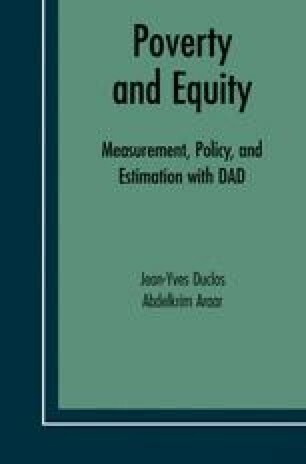 In this chapter, we examine in more detail a more neglected aspect of the notion of redistributive justice: horizontal equity (HE) in taxation (including negative taxation).1 Two main approaches to the measurement of TIE are found in the literature, which has evolved substantially in the last thirty years. The classical formulation of the HE principle prescribes the equal treatment of individuals who share the same level of welfare before government intervention. HE may also be viewed as implying the absence of reranking: for a tax to be horizontally equitable, the ranking of individuals on the basis of pre-tax welfare should not be altered by a fiscal system. Most of the analysis below will involve ethical indices. We will see that, depending on the choice of the underlying social welfare function or inequality index, horizontal inequity will be captured either by a “classical” horizontal inequity index or by a “reranking” one. This chapter draws extensively from Duclos, Jalbert, and Araar (2003), where more details can be found.